Getting published in paper has never been easy. But nowadays it could be said that it’s even more difficult since publishers have become very stringent on who they open the door to due to the economic climate. This could mean that there’s now an even larger portion of unsigned authors with great potential out there who are being overlooked by agents. Nope, thanks to the innovation of the ebook and online distributers, readers are now in the driving seat when it comes to determining what book they want to pick up. What this also means is that, due to openness of the ebook novel market, it’s highly likely that there are more people writing fiction than ever before. Now, the literary industry may have gone through some huge changes over the past few years, but the technology on which books are written and stored on still face the same problems; hard drives can crash, become corrupt and infected with viruses, and small portable storage devices can easily be lost, damaged and stolen. To save all your efforts as you journey through the mammoth task that is writing a book, you should invest in technology’s latest and most advanced form of file protection known as online backup. Not only can you store your novel, you can store copious amounts of your data such as music, videos and photos—from gigabytes, to terabytes, to no limits storage. Avandrive Cloud backup gives you the ultimate form of recovery, since it allows you to recover your novel from a range of internet-ready devices from anywhere in the world. Who says you can only write your novel from your study? 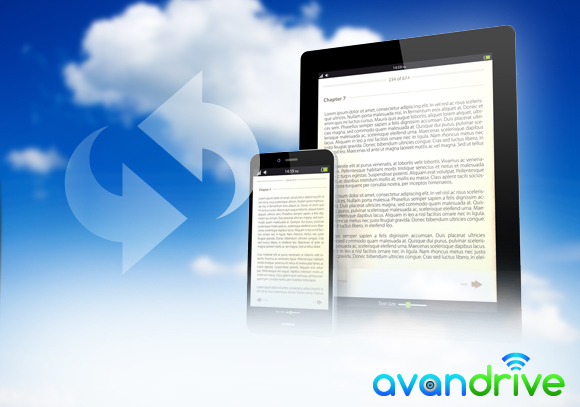 So, as we enter into the new age world of the ebook, be sure to keep yours as secure as possible with Avandrive Cloud Backup. Take control of your future and start generating more income. View and edit files on your Avandrive from any web browser on your computer, mobile and tablet.